Strange name for a tool, but it’s a great tool. This tool range is the premium end of the Stanley range and designed for hard work, wear and tear. You can pick one of these up for around £20 – £30 from a good retail outlet. Some of the bigger DIY stores have them. Firstly the case. This is a nice case made of a heavy-duty plastic with a single hinge at the back and a metal clasp at the front. The lid has a nice detail of raised lettering on the lid that suggests something good lurks inside! The metal clasp has some nice detail work and holds the lid firmly shut. The Lid opens completely to lay right out-of-the-way. This also makes a nice make shift holding area for various screws, nuts, washers or bits that you have just removed or need to screw back on. 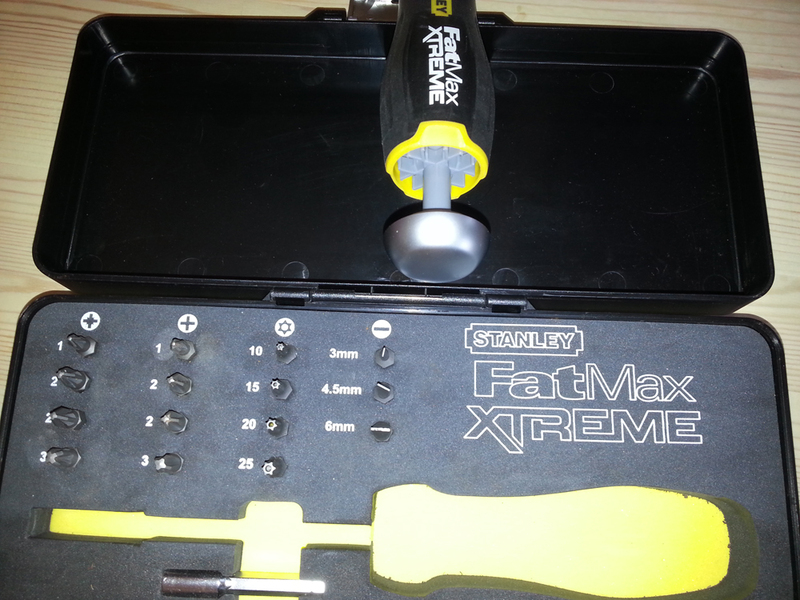 The screw driver is held in place by an exact cut dense foam rubber. Below the shaft is the adaptor piece to hold other bits, and above the shaft is the fairly comprehensive 25 various bit selection. There are 3 x slotted (1 x 3, 1 x 4.5, 1 x 6mm), 4 x Phillips (1 x PH1, 2 x PH2, 1 x PH3,) 4 x Pozi (1 x PZ#1, 2 x PZ#2, 1 x PZ#3), 4 x Torx (1x T10, 1 x T15, 1 x T20, 1 x T25). The handle is made of a heavy plastic with an inset of a firm rubber that feels good in the hands. the collar has a 3 position setting, clockwise, counter-clockwise and lock in the middle. The base of the driver has a natty little trick up its sleeve! if you pull the base down it will click open to expose a holding area for 6 bits as you need them. This could save you taking the whole case with you and just take what you need, or add the more obscure bits you need, that way you can get to carry even more of a comprehensive selection. This will give you a total of 21 storage positions. That’s without chucking a handful in the case just for the sake of it. The bits seem strong enough at the moment and only time will tell if they start to round off, break or stay in shape. The fact that you can buy the many different bits is a bonus, as the bit holder is the industry standard size, and you can replace them as you need too. The adaptor is handy, this enable me to put in bit that incorporated a socket for small bolts. 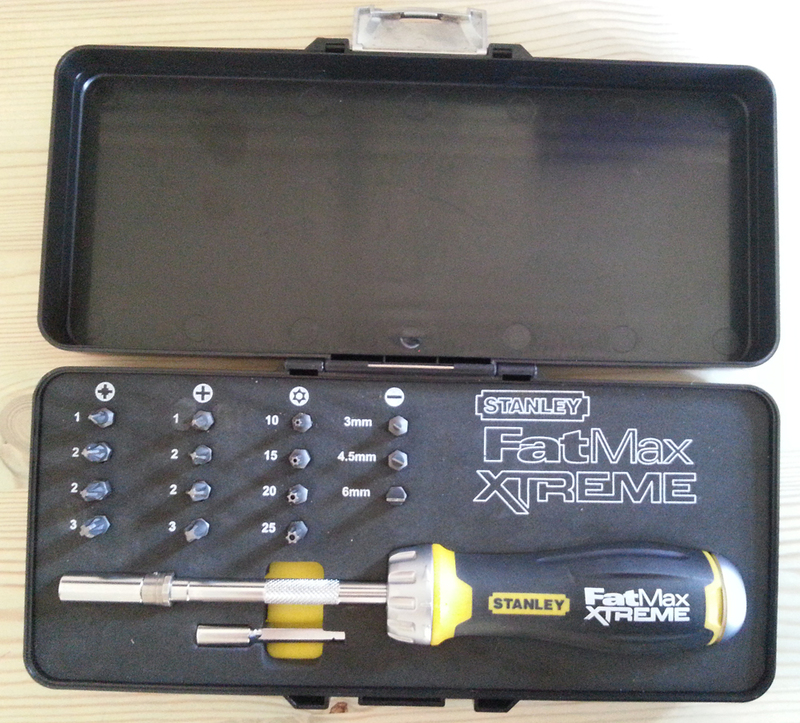 I was able to use the screw driver as a hand-held spanner that had very small space to get to. My extension pieces weren’t quite long enough for the job. That issue has now been addressed with the appropriate purchase! Large case could take up space in a tool bag? I really like this tool. I have had many ratchet drivers in the past but this is the best I have had so far. The fact there is very little movement required before the next ratchet engages sealed it for me. I was able to use some serious torque on the driver and it didn’t flinch. Everything is clearly marked out in a nice case and keeps it all together. This is a good buy, you could spend less and get an ordinary ratchet driver. But before you do, if you can compare them side by side, I wouldn’t mind betting that you buy the Fat Max version! On a side note, I have seen and used the Snap-On version of these tools. It did feel good and the ratchet was nice. But, the issue was the magnet lost its force and fell out the end. Not to good, and that is not the only time I have heard of that either. It was fixed of course by Snap-On but I can do without that sort of hassle to be honest.